I am a project person. Give me a goal, a time line, and I’ll come up with a plan of action to bring the task to completion. So as I began the daunting task of sorting through the thousands of photographs that I’ve take over the last year and a half in my multiple travels, I knew I had a project brewing that would fall in line with my original goal of starting this blog – the goal being to help cultivate a love of gardening by informing, encouraging, and simplifying the plant world. Along the way I’ve also tied in a bit of life because I am always growing – either horticulturally or metaphorically. THEREFORE, it is with much anticipation and a little trepidation that I begin my next blog project – 365 Days of garden treasures from around the country. Some days there will be stories and pictures about these gardens or the people behind the gardens, some days there may be just the who, what, and where with a few photographs. Check in daily and take a glimpse of some great gardens! Day 1 – If you live in Quebec, year-round gardening is an indoor activity. And my friend and Garden Writer’s Association President Larry Hodgson built a living tropical wall into his home in Quebec City. I caught up with the Larry while he was in the bath tub (giggle) and gleaned a little about how he built this botanical bathroom beauty. Larry gives us the grand tour of his indoor tropical paradise. Rocks cover the drain which captures the gentle waterfall that drizzles over the plants . Larry has a pump on a timer that drips from the top of the wall onto the plantings. 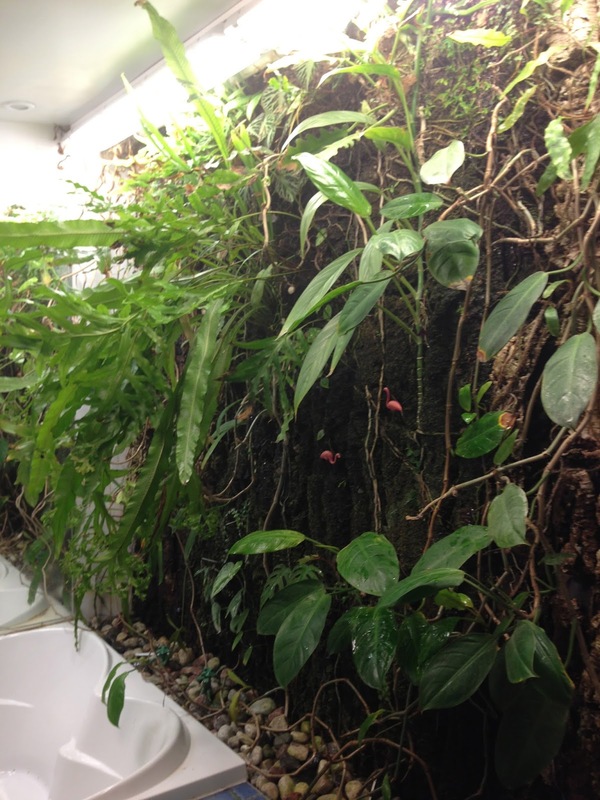 Cork was attached to the wall against a waterproofing wall liner; the plants grow in a thick mass of moss. Can any garden be complete without pink flamingos? Larry, if you get a chance to read this, chime in with more details – inquiring minds want to know.